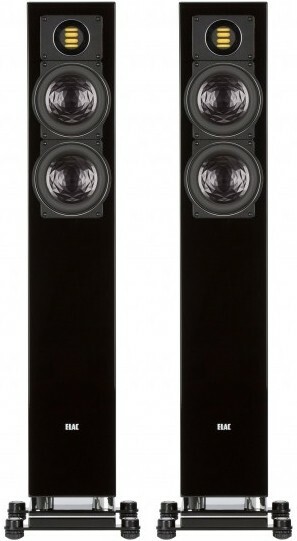 FS 407 is a floorstanding alternative to 403 bookshelf speakers from the Line 400 series with a newly developed chassis to match JET 5 tweeter, setting a new sonic benchmark for their class. Earn 3239 loyalty points when you order this item. 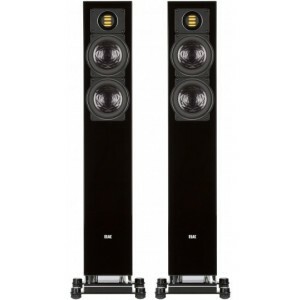 FS 407 is an elegantly proportioned, floor-standing loudspeaker of 2½-way, bass reflex design with an appearance as beautiful as its sound, able to effortlessly recreate the realism of a concert hall, even in large rooms. The 400 line is a striking illustration of how design and function can be seamlessly combined. Decorative aluminium elements transform the technical components of the loudspeakers into visual highlights and the crossbar support system fitted to the floor-standing models provides an elegant and extremely stable foundation. The eye-catching surface of the crystal membrane is more than just an attractive design feature. Woofers and midrange drivers in the Line 400 employ the Crystal Membrane (patent pending) and their design is based on ELAC’s Aluminium-Sandwich AS Technology. The crystal-shaped inverse aluminium dome is joined to the paper cone in a special gluing process to result in the desired sandwich construction. Resembling the surface of a large crystal, the aluminium-foil stamping stiffens the aluminium dome, diminishing resonances and minimizing coloration, while improving power handling and dynamics. 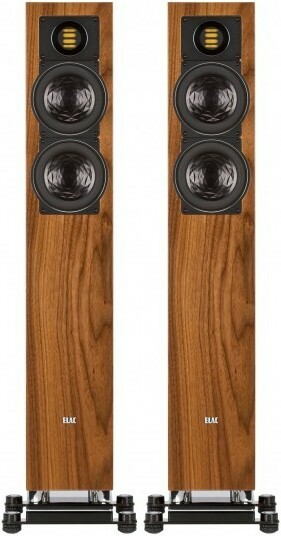 The voice coil design of the midrange and bass drivers results in an expanded range of the respective drivers by nearly an octave. 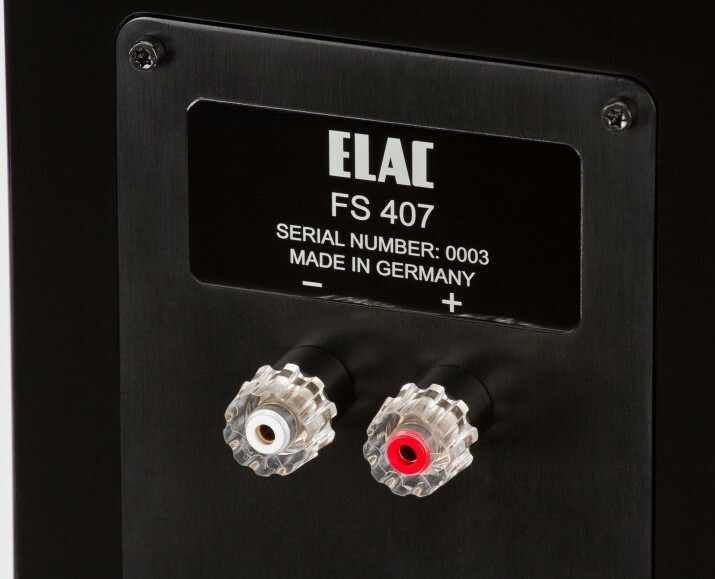 The wide, double-asymmetrical rubber surround of ELAC’s TT 180 woofer used in the FS 409 can handle up to ±15 mm excursions for truly prodigious volume and lowest distortion, a unique engineering achievement for a driver of its size. Delivering true high-definition sound, ELAC’s award-winning JET 5 tweeter thrills with lightning-fast response and wide dynamic range offering minimal distortion, lots of headroom and a distinctly wider frequency range than conventional dome tweeters. The core is the folded foil membrane with a fold width of only 0.84mm. For repeated accuracy and unchanging quality with high production capacity, gluing and handling are executed by two SCARA robots. The folding and fixing of the membrane is executed by hand since the manual dexterity of skilled technicians is irreplaceable. The linear frequency response is ideally suited for DVD-A and SACD reproduction. 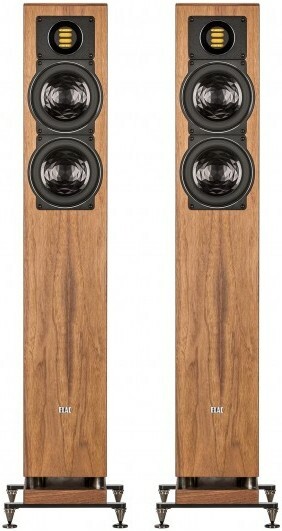 All Line 400 speakers are equipped with a fabric grille over a wooden frame that is attached only through the force of magnets hidden beneath the surface of the cabinet. Listeners who prefer to look at their speakers and listen without a grill will appreciate the clean design and uninterrupted surfaces of the impeccable ELAC cabinetry. The speaker feet in M8 thread size come with a choice of spike or rubber inserts to provide the required stability, whether on hard flooring or carpet. 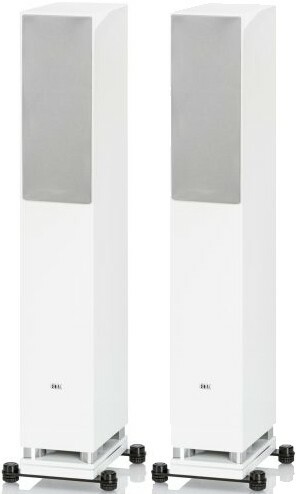 Both FS 409 and FS 407 floorstanders are offered with a plinth on adjustable ELAC spikes and rubber feet. 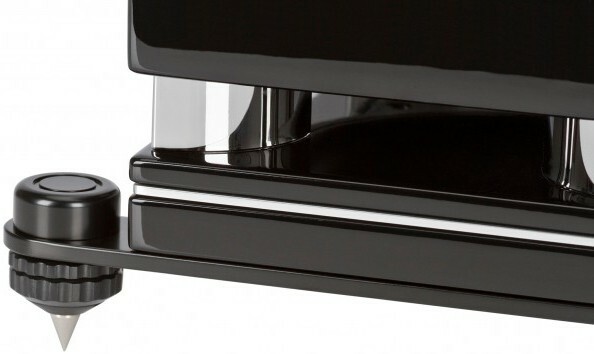 For a more flexible speaker placement and to minimize ventilation noise, the bass reflex port is directed to the floor, exiting the bottom of the speaker cabinet in a down-firing configuration. To minimise mechanical vibrations and ensure maximum rigidity, the baskets for cone drivers used in the Line 400 speakers are made of cast aluminum instead of pressed or stamped steel.